There’s one dish that always gets me a little glassy eyed whenever I think about it. It’s a dish that has always been a favourite of mine. Ever since I was a little boy I would get excited at the thought of eating Toad In The Hole. 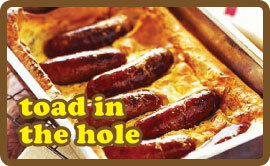 For those who don’t know what I’m referring to, Toad In The Hole is a glorious combination of sausages and batter mix. The two, when baked together form one of the most satisfying meals there is. It doesn’t get more delicious than this. In a measuring jug, pour in some flour until it reaches the 300ml mark (levelled out). Add to a bowl, break as many eggs as it takes into the measuring jug to reach the 300ml mark. Add to the bowl and beat in gradually, then measure 300ml milk in the jug and add to the bowl gradually, stirring constantly. Mix together using a whisk for 4-5 minutes to form a batter, season with salt & pepper. Leave to rest for 1/2 hour then whisk again for 2 minutes. Add 2 tablespoons of vegetable oil to a roasting tin and place in the oven for about 5 minutes. Meanwhile, fry the sausages in a non stick pan for 4-5 minutes until golden brown all over. Open the oven door and slide out the shelf. Add the sausages to the dish, then quickly pour over the batter mix. Close the oven door and bake for 35-40 minutes until well risen and golden. No Toad In The Hole would be complete without lashings of onion gravy and mashed potato.